3:00pm: It has been an uneventful day thus far. Since this morning, I’ve been trying my hardest to catch up on emails, blog comment replies, and returned phone calls. At the same time though, I’m happy to be sitting in the living room on the recliner, hitting the keys as my two year old “Pink” plays at my feet while occasionally sneaking a finger over to touch my keyboard. 5:45pm: After a round of grilled cheese sandwiches, I’m headed to drop my 8 year-old son off at a friend’s house who will be taking him to church while I’m tending to my coaching duties. Tonight I’ll be “drafting” the players of my daughter’s 10-12 year old Little League girls softball team where I’ll be the head coach this upcoming season. 6:30pm: I show up to the Little League office with my 2 and 5 year old daughters. As we walk through the door, the coaches on the other team that will also be drafting give me an odd look, but that’s quite alright. Within minutes, I’m sitting down with one daughter on each knee, picking the players for our team. They are perfect the whole time, and 25 minutes later we’re on the road again. 7:30pm: Just arrived to church with my two little ladies. Both fell asleep in the back of the car and aren’t too thrilled to be waking up. We’re here because my son has cub scouts tonight and I also serve as what’s called a “branch president” for the church in our area. In most churches, this would be something like a pastor, although it’s an unpaid position in this case, but it gives me the opportunity to work with and assist many youth and families in our area. 9:00pm: Finally back home for the night. The girls are zonked and I do my best to dress them, give them the right medicines, and get them ready for bed. It has been a long day, but within about 20 minutes, everyone is tucked-in. Unfortunately, my littlest one has a bad cough and the medicine seems slow to do its thing. I had wanted to go downstairs to get my workout done on the elliptical, but I don’t feel good about leaving everyone alone upstairs, so the workout will have to wait. 11pm: After reading for a good while, my eyes and mind seem to have nothing left. Usually my late night workout gives me a couple more hours of energy, but without it, I’m scratching the bottom of the barrel. Laying my head on the couch pillow, I’m asleep in seconds. 1:15am: My wife and daughter finally make it home from their concert. They had a great time. After 2 hours of sleep, my head hurts and I very much just want to go to bed. But I still haven’t worked out yet for the day, so I sit on the couch and literally debate with myself for the next few minutes as to whether or not I should just go to bed or drag myself to the elliptical. 1:45am: I’m on the elliptical and feeling much better now. As always seems to be the case, if I can just get through the first few minutes, I’m home free. We live in a hectic world. More than ever, we’re being pulled in a hundred different directions at any given time. And as we all seek that great mystery called “success and happiness,” there is one word that often pops up again and again—balance. I started off this post with a 12 hour segment of a day I experienced this week. Looking at the surface, there wasn’t anything necessarily “special” about what happened that day. Notwithstanding, if you go back and look, I think you’ll find that all 5 of the above elements were addressed at least somewhere in that time period. And for me, that’s the key. I work each day to put myself in a position to address all five elements. This is why I’m coaching my daughter’s softball team. This is why I own an elliptical versus having to make a trip to the gym. This is why I often work from home and have learned to work around my little ones. At this point in my life, I try to look at each day with this same approach. Am I spending quality time with my wife and children? Am I doing the things with work that will lead to complete financial peace and prosperity? Am I learning each and every day? Am I taking care of my body and ensuring to keep my weight down while my energy stays up? Inevitably, if one of these areas slacks off or falls apart, the others suffer as well. For whatever reason, that just seems to be the way it is—thus this constant quest we each endure to find balance. I don’t write this post claiming to have all the answers, because I don’t. My life is like yours—many ups, many downs, and a bit of everything in between. But this much I do know—balance is huge. If we’re financially rich but emotionally broke, what have we done? If we’re spiritually strong but under huge amounts of financial debt, how can we be well? If we’re right with our kids, but physically unable to play with them outside, are we going to be happy? The list of examples goes on and on, but I know you understand my point. 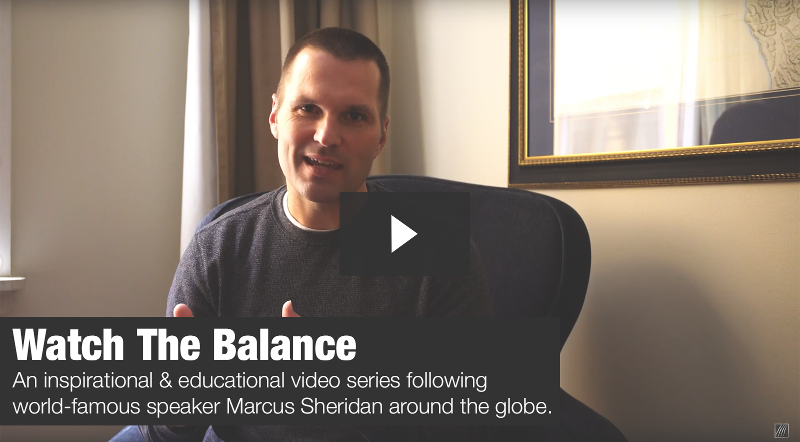 So that’s our challenge my friends—finding balance in a turbulent world of distractions. Is it difficult to achieve? Yes. Will it be a constant battle? Yes. But is it possible? I’d love to know how you’re able to balance family, work, health, and all those other aspects of your life. What do you do each day to find peace with each area? What are your biggest struggles? Jump in, I’d love to hear your thoughts. What I do each day to find peace and balance is to BE as fully engaged as possible in what I’m doing in the moment. Whether that’s writing for a client or for my blog, training (I’m racing two 70.3 triathlons this year) or relaxing with my husband. The ONE thing I implemented recently that I’m proud of is I set aside two day in my schedule (Mondays and Fridays) to work ON my business rather than IN it. I only implemented this last week and it has made a HUGE difference in my productivity and peace of mind. I now KNOW when my blog posts will be written, when new products and classes will be developed AND I know that all client work will get done on deadline. Which makes room for training, for more money to come in, for all of it! Have a great weekend. •	Am I spending quality time with Glenn and our friends and family? •	Am I doing the things with IBW and Frankly Good Coffee that will lead to complete financial peace and prosperity? •	Am I learning each and every day? •	Am I taking care of my body, mind and spirit by following my training schedule? •	Am I right with God? Achieving balance is indeed a challenge (and I know! I have FIVE kids…one who is a wee bit chromosomally enhanced). But Marcus – wrapping up your day at 3:20 am doesn’t seem very balanced to me! That’s NUTS! Now, granted, I wake up at about 5:50 every morning, so I’m working with that context in mind. I’ve been toying with the idea of taking an (away from home) office; I’ve been finding it increasingly difficult to draw those lines between work and play, especially as my business scales and the demands become more pressing. Do you work from home Marcus? I’m wondering your thoughts on that very practical consideration. For myself personally, routines help a lot. I can’t work with schedules, because life never goes precisely as I plan and then I get frustrated. But having certain routines in place help me to maintain that balance, because then I know that I’m getting the most important things done every day. Routines also put a certain rhythm into my days and week and somehow make them go more smoothly. I have also been testing what I can accomplish when my kids are around me, and email is something I always do in the living room or in the kitchen. I hope you’re having a wonderful weekend Marcus. Finding right balance has become very important. I think your 5 points can be taken as baseline for measuring our work/life balance quotient. You have not heard from me in a while I know. I am not a blog commenter but I did have too on this post. Balance is huge. We made the commitment this last winter to keep our priorities straight with faith (God), family, and then work, believing that if we did our business would be stronger for that. Since we have made that decision our business has taken off like you would not believe. It does help that we took your advice over a year ago now and embraced content marketing, and we are seeing HUGE payoffs. But that balance is very key. Great post. Its nice to read what you do in a day and and to see a little insight into your family life! Your little girl is very cute! Well done on keeping a good balance between work and family, I know people do find it very hard! Balance is something I struggle with mightily. I’m still trying to find balance in my life. At times I get worried that balance will never return… But then I think on it and realize that finding balance is part of the Life Struggle we all most endure on the path to happiness. I’m glad you’ve found yours Marcus. I wouldn’t say I’ve found mine bud, but I think the key is being aware of it and knowing the ways by which you’ll find it. You know, some folks say, “I want balance” but they don’t really even know what that means for them. Just keep workin for it my friend, it will come. Nathan!!! How are ya bud? Boy is it nice to hear from you and also hear that you’re doing well and going in the right direction. Thrilled you stopped by man and even more thrilled that you seem to be so happy with your life. That’s a good point and something that I thought about right after I posted my comment. Does everything need to be in balance for me and wife to be happy? Naveen, how are ya bud? Really appreciate your kind words. Hey bud, good thoughts. That is one thing I didn’t mention here– TV. Although I do watch TV, I ONLY watch it when I’m on the elliptical. This way, my workouts go quick but I’m not spending any time at all without “producing” something. For example, when I’m with my kids, I’m “producing” a stronger relationship with them. When I’m on the elliptical, I’m “producing” more health in my body. When I’m writing an blog article, I’m “producing” more readers, opportunities, cognition, etc. But when I watch TV, I’ve never really been able to “produce”, ya know? This thought process is what I use for a lot of my activities. BTW, thanks for that OptinSkin article. I read it this morning and I’m sure I’ll be getting it soon. 5 kids Ruth!? Wow!! You really are juggling quite a bit, aren’t you? I’m in the process of adding on to my house right now so that I have a very, very private office that is away from everything. I’ll use this office for phone calls, blog writing, video “stuff”, etc. Notwithstanding, I do try to group activities to “home” vs “office” on certain days. That way on the days I have light activities (like today), I’m home. In fact, as I type this I’m looking at my wife and kids sit on the couch in the room next to me while they watch Mary Poppins (it’s raining here in Va so it’s a good Saturday morning for that. 😉 ). With my home-office not yet being complete, I’d say I currently work 2-3 days at home each week, and 2-3 days at my away office. Keep up the great work Ruth! Personally – I’m getting there. I’ve still got a long way to go (and let’s be honest, the journey never ends), but as long as I’m pointing in the right direction and have some momentum, I’ll be happy. So glad you liked it Steve. Hope you’re well! Two 70.3 triathlons Stef? Really?? Dang girl,that’s some awesome sauce! BTW, your goal to work “on” vs “in” is an exceptional one, and I hope to hear more from you on how this goes as the year progresses. You really makes this community a better place Stef, thank you! The nice thing about blogging is you can do it from anywhere. The bad thing about blogging is you can do it from anywhere. In other words, the lines between work and home life can become blurred. The TSL community might recall Marcus’ recent post about letting your employees write. Marcus referenced our company in that article, just after coming out to our offices for a inbound marketing summit. Some of you have asked to keep the TSL community apprised of our success. So far, so good. Maybe too good. I can hardly keep up with all the editing and filtering of ideas. So now Marcus suggested that I hire and delegate my duties to a Chief Content Officer. He even went as far as to call me a “big dummy” if I didn’t! Guess what…I’m taking his advice. Why? Well, I can only juggle so many balls at a time. Equally important is I’d like to make the lines between work and home life just a little less blurred. My wife thanks you for that Marcus. Anyway balance is the key to everything and actually when we are healthy we are in a state on balance and when we are sick we are unbalenced, roughly said. The same goes for the five kinds of health you perfectly detailed Marcus, and being so busy it’s pretty much amazing you’re able to keep balanced all of them. Surely it ain’t easy but it can be done, with a lot of organization and focus, right?. Great article. Have a great weekend! Work life balance is what I have based my whole life on these last few years and it is working a treat – I study full time and still make mortgage repayments. Family, gardening, going to the beach and exercise are all part of the equation. Working from home with my business and being able to be there for my daughters is part of it. I can totally relate to some of this post! I find that my best working hours are between the hours of 10pm and 6am. If I have a project like my website for example that I feel blocked on I suddenly get inspired around 10 and finish around 6 am. It drives my husband crazy. Nice, Marcus….I’m especially glad that someone else finds it perfectly acceptable to go *back* to work at 1am and not stop until it’s done! Always enjoy the posts and insights into how you make it happen, thanks Marcus. There’s a guy I work with who said to me “I don’t know how you have time to maintain a blog.” I read this post and i fee like a lazy so and so. I don’t have kids and i barely find the time to get stuff done in my life. Balance is HUGE. I agree but so is sleep which is one of those balance things. What works for me right now is prioritizing what’s important in my life. I don’t have anywhere near the drive and participation that you do and I commend you for being able to juggle all that and actually BALANCE it out. Great questions. What about “Am I getting the rest my body/mind needs to be productive? That’s one I struggle with consistently. You seem to be an expert at managing all aspects of life. I learned a great deal from you. I’ll try and follow some of your tips, and hopefully they will work out for me as well. Ummm, WOW! So that’s how you do it all! You are an amazing person! Meanwhile, i just found out this afternoon that my Memere goes to bed later than I do 🙂 Maybe I need to jump on the treadmill when I feel the need for a boost. Thanks for letting us into your life once again Marcus. Thanks for this, Marcus. Balance is a focus in my life as well. I’m a father of three sons aged three to 10, I run my own “business” (it deserves quotes until it makes money) from home and I’m an active Little League coach. This is the first year I’m going to try coaching while running my own business. I’m actually a bit worried about it. When working for “the man,” I found my job responsibilities fell neatly into a bucket that could be easily controlled. Now, I feel I never have enough time to do all of the things I need to do for the business. And now I’m going to throw Little League coaching (which I LOVE, and don’t want to do it half way) into the mix. You know how it is. Practice, two games per week — for the team I’m coaching, not including my other son’s team (and I’d like to assistant coach for his as well!). Family is my top priority. Making my business work is second. Sliding down the list is my health. And while I’m conscious of it, I need to make more time for exercising and relaxation. I actually scheduled it in starting last week, and that lasted one day. I find it incredibly difficult to create structure out of this life, but I need to figure out a way. This helps. Thanks for your always inspiring and helpful words! :-)! Thanks Marcus, love being a part of it. Great Post – Found some really useful content – Since I am a family man as well. Thanks for a great reading experience. Marcus – I truly appreciate your time and energy of putting this blog post together. As a mother of two young ones (2 1/2 son & 6 month old daughter) finding that there are other people working on the balance of these 5 is encouraging. Sounds like you are doing a fantastic job! This was especially perfect timing for me to read on a Monday morning. You are an inspiration to new parents like me who are just getting adjusted to the realities of being a parent and trying to balance everything. I confess that not all of my areas are being addressed to the extent they should be. This is one of those “wheel of life” metaphors: a wheel with uneven spokes (i.e. not paying attention to all areas that are important) will run wonky. Thanks for showing the rest of us how it can get done. Peter! I saw that article and thought you did GREAT! Very nice job and I really appreciate you taking the time to stop by here and share your thoughts as well. Good luck with finding that balance man, it’s a never-ending quest, that’s for sure! Hey Meredith!! I’m so thrilled to hear that from you, as it’s nice to know that we’re not alone in this world with our struggles, our triumphs, and our day to day life. You’re welcome Anton, have a great week! Wow Jon, seems like we have a ton in common man, sweet!! Love your priorities and what you’re doing….and let me know how the season goes for you bud! Hahahaha, you always make me smile with your wit Christina 🙂 But that late night workout does provide an amazing boost to tell you the truth, I’d get wayyyy less done without it. Have a great week and I hope you’re doing well! Hey Ralph, thanks a bunch for dropping by. Don’t beat yourself up man, just try to keep getting better, that’s all I really do to tell you the truth. Every day is a new challenge. I do wonder however, as to how do you manage to work that late at night- as the kids would need your attention early morning as well 🙂 I know for myself and my husband, if we don’t call it a day at a set time- the morning schedule goes for a six! Marcus, you are an amazing role model, and that little cuteness is making you look WAY handsome and happy. Thank you for sharing your passions and for encouraging even those of us who think they are doing a good job push things to even a higher level. YOU ROCK!!! !